I find a lot of colours, but sometimes I don't find words. Looking like Carmen Miranda doesn't make me able to sing unfortunately, so I stay mute. I always have something to say and never wear trousers. Today it's the opposite way around. Maybe it's the beauty of this Pearls & Swine creation that leaves me speechless. 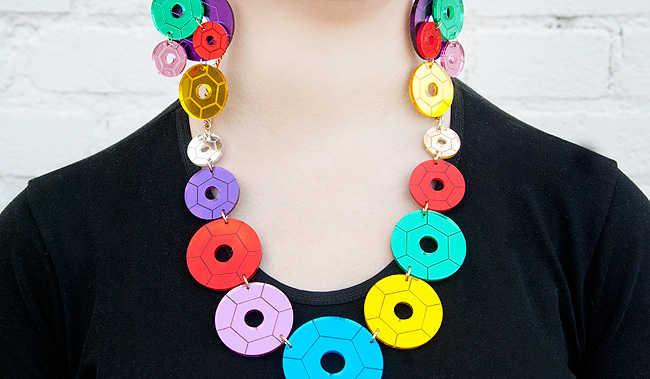 Vibrant colours speak for themselves! Laughing away my writers block and dressing quirky. 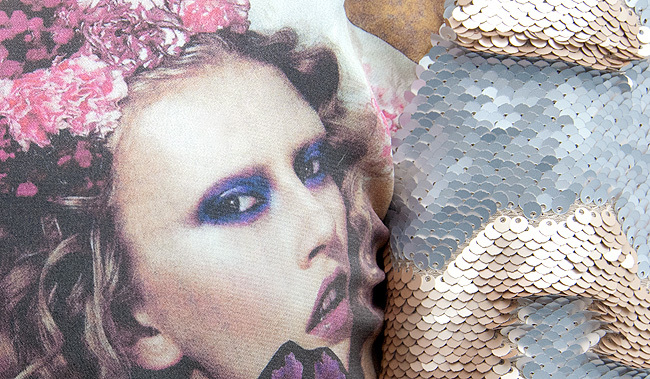 If you have sequins, everything else is not important, agreed? 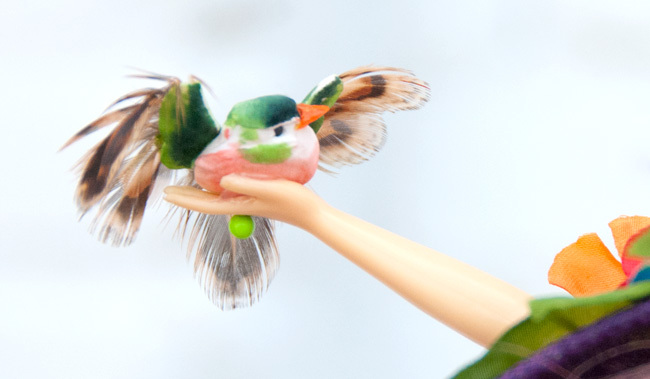 Cute detail of my fascinator with a Barbie arm and a darling little birdie. Maybe I should tell you a story from the land the hot-air balloons on my trousers come from? 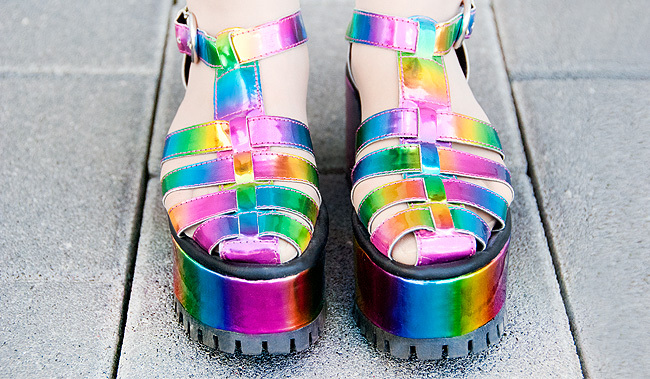 Rainbow feet may cause a sudden rush of inspiration, let's try! 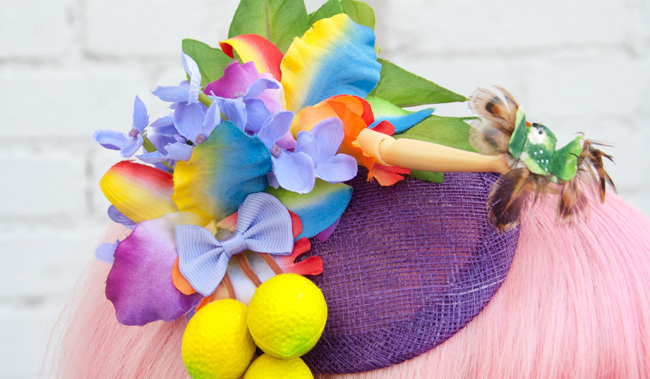 While I look like a Carmen Miranda version for beginners (or intermediate if the beholder is generous with me) I don't have an idea what to write and stare at the screen. A colour bomb, but no explosion of words. Oh hello, writers block, I thought I'd never see you at my doorstep, but after three and a half years of blogging you finally found me. You even brought a gift: An inexistent idea of a topic to chat about, how lovely! Is anyone interested in the musings of a fashion blogger or are you just here for pretty pictures? Does somebody even realise if I just use dummy text? Let's make a test: If you read this, comment with "pink poodle". Anybody? Please, please, please. You'll be my ultimate hero if you tell me what topics you'd be interested to read about here. Until then, I continue my search for the words I lost: Does it help to make a handstand? Maybe I better don't try, shame on unathletic me… Half a day later: I cooked some homemade tortellini, tidied up my flat and repotted plants. Still no single word is written on my blank page, but at least my home benefits from this misery. Can it be so difficult to find a few words? No novel with a 1000 pages required so come on Sara! The next day: Must have fallen asleep while trying to write something and finally I give up. May the words reappear till the next post. Enjoy the colourful look in the meanwhile and appreciate that I talked rather visually than linguistically. Even Game of Thrones fans must admit: Summer is coming! 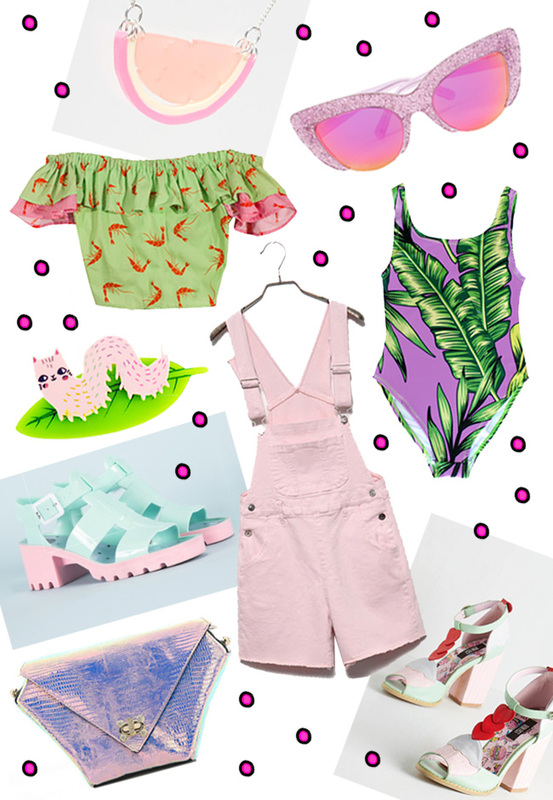 Time to start dreaming of splashing in a swimming pool and thinking about what to wear. Probably 99% of all girls (including me) don't feel very well being almost naked in public, but I promise: It gets (a little bit) better if you are wearing a stunning bikini or swimsuit. 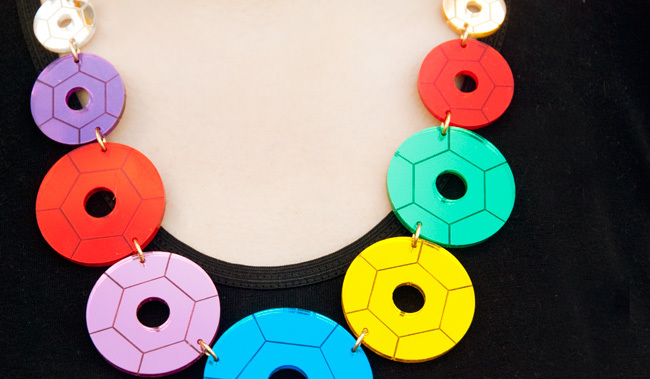 People will look at the fantastic print of what you wear instead of the structure of your orange peel skin. 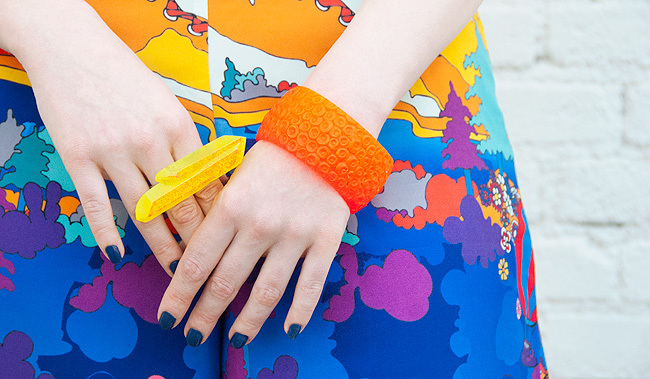 Anyway: We are all not perfect, and it doesn't matter, so celebrate summer with a colourful beach look and just have fun! So tell me: What do you like best from the beach fashion here and do you have summer holiday plans already? 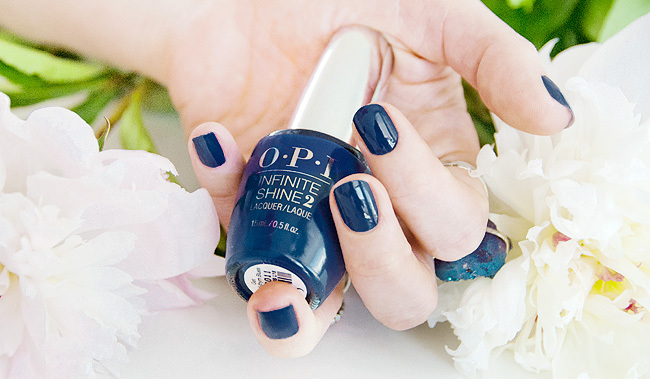 OPI Infinite Shine "She Went On And On And On"
OPI Infinite Shine "Set In Stone"
OPI Infinite Shine "Get Ryd-Of-Thym Blues"
How much time does a woman spend painting her nails in a lifetime, weeks or even months? It must be an impressive lot of time for sure! So, is there a way to make it less and save your precious time? The OPI Infinite Shine Gel Effects Lacquer System promises to be the holy grail of nail polishes and have a solution. Besides an ultimate glossy effect, the press release promises this innovative nail polish stays for up to ten days. 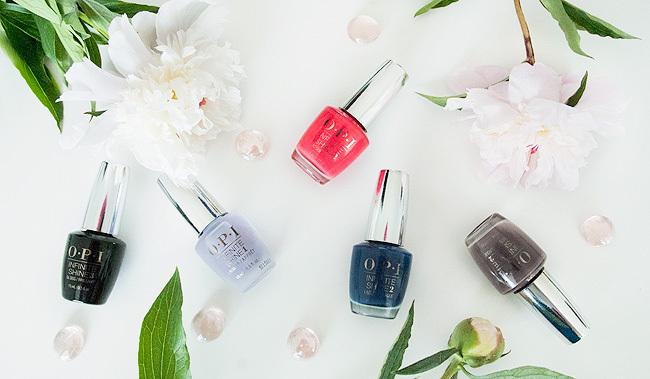 Since OPI is the world leader in the professional nail care industry and provides high-quality products, the expectations are high. OPI Infinite Shine doesn’t need a lamp for drying and is easy to remove with nail polish remover. It's just like the nail studio has come to your home. 1. Primer Infinite Shine: Base coat to protect your nails and for long-lasting stay. 2. Lacquer Infinite Shine: Available in 30 exciting colours. More will follow every season. 3. Gloss Infinite Shine: Top coat for super glossy gel-finish effect. I love the glossy effect OPI Infinite Shine has and the pigmentation is amazing. It looks more natural than a gel manicure while it's far more glossy than "normal" nail polishes. The available colour palette is very exciting and I am tempted to go for more colours. From the three colours I tested, the dark blue ("Get Ryd-Of-Thym Blues") is my favourite. Three days after applying it the first chips appeared. Bad nail polishes usually just stay a day on my nails without chipping, so this makes it a very good polish even if the marketing promises didn't prove to be true. I tried the Sally Hansen Miracle Gel before – another gel system nail polish – and this one is far superior. I can recommend OPI Infinite Shine, don't expect miracles, but a lot of shine on your nails for sure! 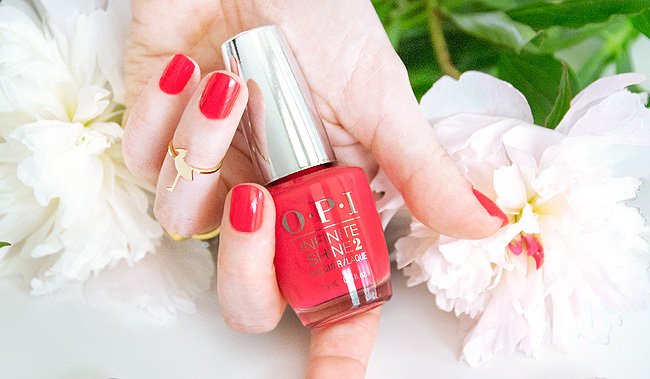 Buy it at your local OPI reseller or find out where to get it in Switzerland here. 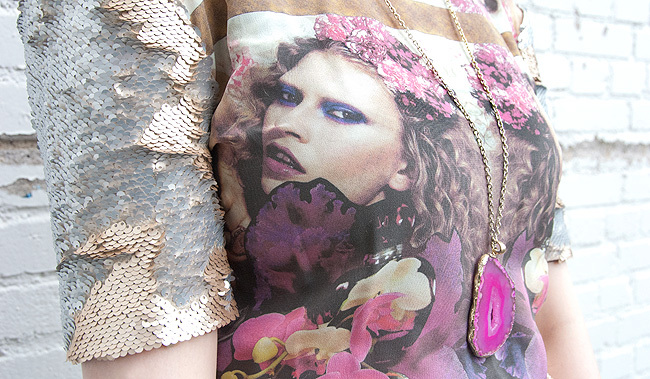 Golden Sequins & Pink Flowers: A look with a little bit of baroque inspiration. 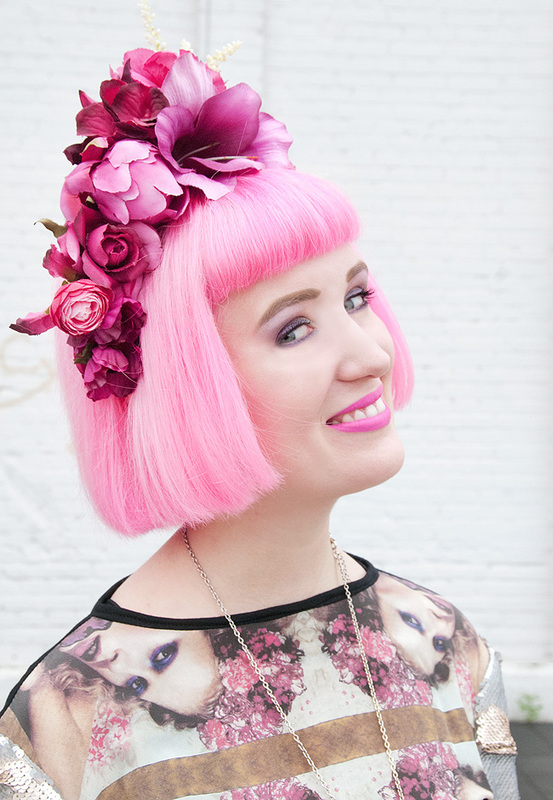 No Crown of Gold Required: I rather have bright flowers on my head. Elegant & Casual: No need to decide when you can mix. Crochet Love: Because ladies know that gloves have more uses than just to keep your fingers warm in winter. 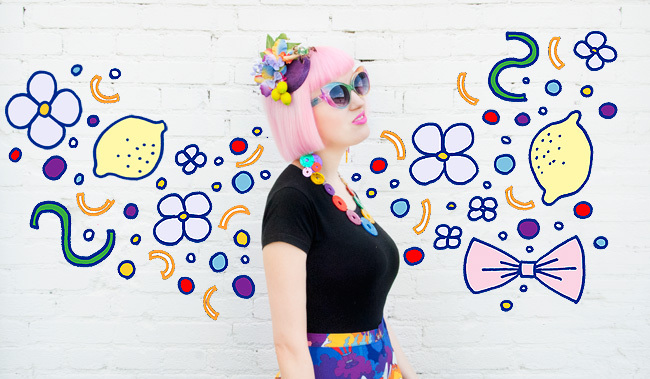 Triplets: Or how to get away with three flower crowns in one look. Just Smile: Because wearing a freshly created look makes happy! 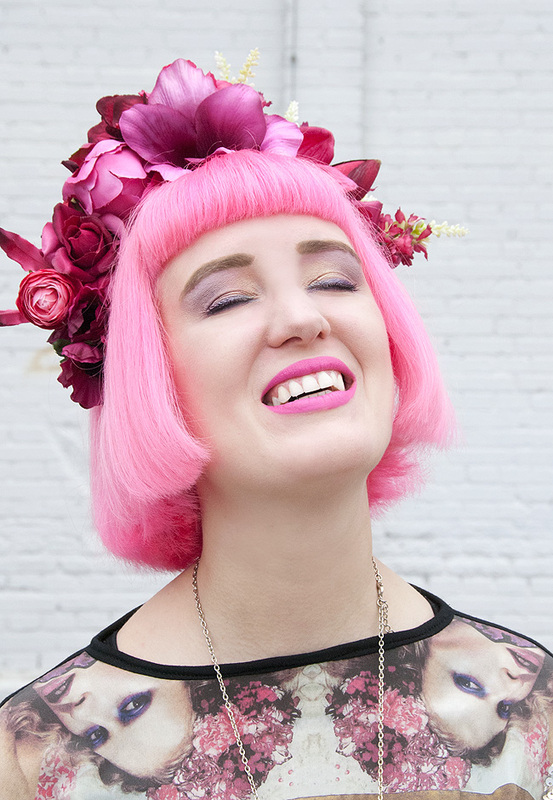 Wear Your Flowers with Pride: Because every girl should wear a crown from time to time. Blue Eyes: Wish I could copy this stunning eye makeup. Vivienne Westwood Vixen: A real classic in my shoe shelf. Modern Madonna: Trying to pose like a statue. I am the Scrooge McDuck of fashion. While Uncle Scrooge takes a bath in money, I feel the happiest diving into my wardrobe and hoard my textile treasures. Some not fashion people might say this is a waste of money. I disagree because it makes me so very happy. When Uncle Scrooge counts money, I count sequins. And I feel the dramatic need for more, constantly! Life is too short to spend it with cold metal, so I exchange it for soft fabrics. But let me tell you another thing, like every coin has two sides, so do I: Sometimes even I feel an overdose of consumption and I am not all material girl. I take responsibility for our environment, think about what it means to have the things produced that I wear and buy a lot from small designers instead of big chains. I don't want to waste resources and just buy what I cherish. A completely new look very often doesn't need everything new, but just one key piece. This is what I prove with this look. Everything in this look has already been in my wardrobe. 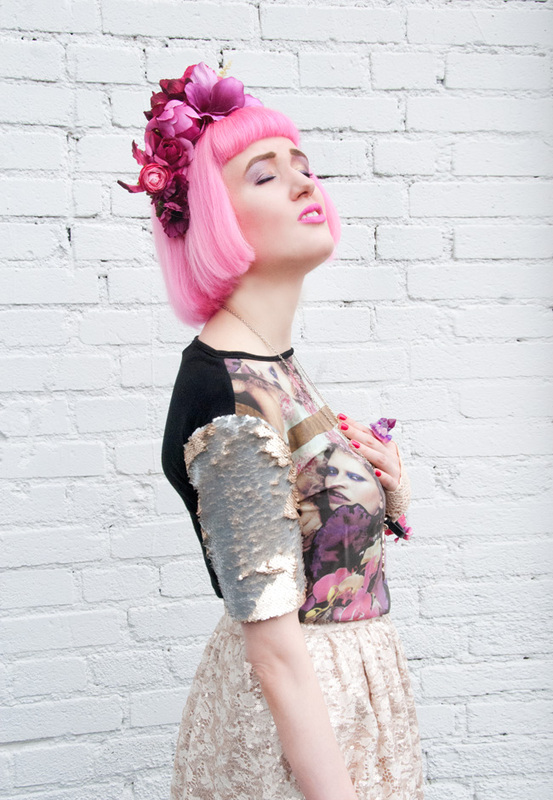 Just the top is new: Sara Di Salvo's (Hot Couture) mirror print shirt is a true game changer. Aren't the sequin sleeves divine? They look like pure gold when all the sequins face the same direction. As soon as I discovered they were silver on the other side, I had to play with them. The disarranged structure I gave them for the pictures made me think of a very casual attempt on Alexander McQueen and his designs inspired by mysterious undersea creatures. Do you agree so, dear Uncle Scrooge? I am very curious to hear your opinion about this look. Originally, this would have been my Friday Favourites post, but sometimes things turn out a little bit different and my daytime job kept me from finishing it. 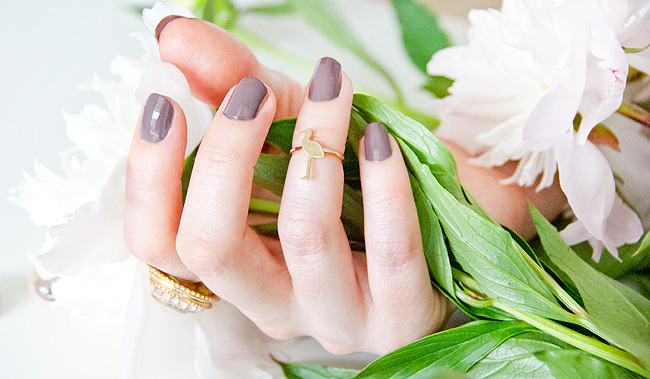 Isn't Sunday the best day for pretty things in any case? I imagine you, sitting on the balcony, wearing radiant sunglasses and reading this post with your laptop on your knees. Do you feel the summer in your heart when your skin gets touched by warm rays of sunshine? I promise, this summer will be a very sweet one, there are loads of pretty pastels ready to land in your shopping basket. I collected my favourite finds just for you. 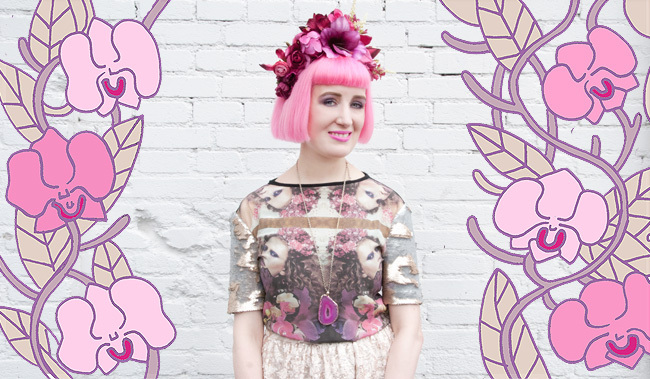 Last month in London, I met my very special lilac-haired friend Hanni. She is a big inspiration and I don't know anybody who lives the pastel dream like she does. Her whole flat is a divine pastel wonderland and she looks like the sweetest candy cane in the whole universe. Every time I see her, I feel the urgent need for more pastels too. So Hanni, this post happened under your influence. Please tell me what you think about my wish list pieces. Have a happy Sunday and maybe start the week wearing pastels. 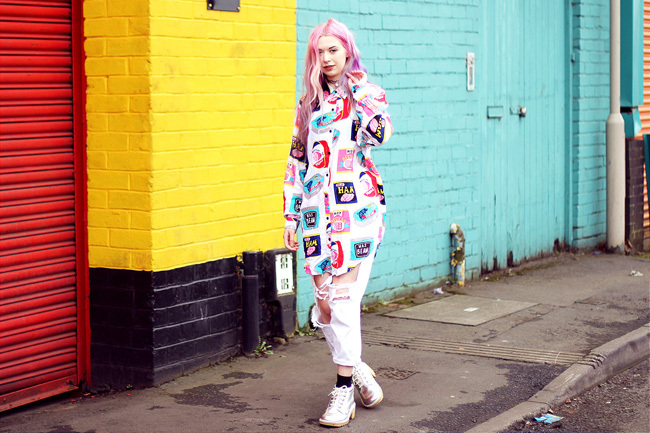 Last month I posted my first monthly fashion favourites post and told you about my vision of cool bloggers all over the world unite and work together. I was surprised by the amount of positive feedback I got and think I actually said something many bloggers had on their mind as well. I hope I can inspire more of them to follow my example or come up with ideas of how to connect to a colourful and bold fashion crowd. Life is too short for spending it on a lonely cloud! If you have any ideas what we bloggers could do together, please let me know. 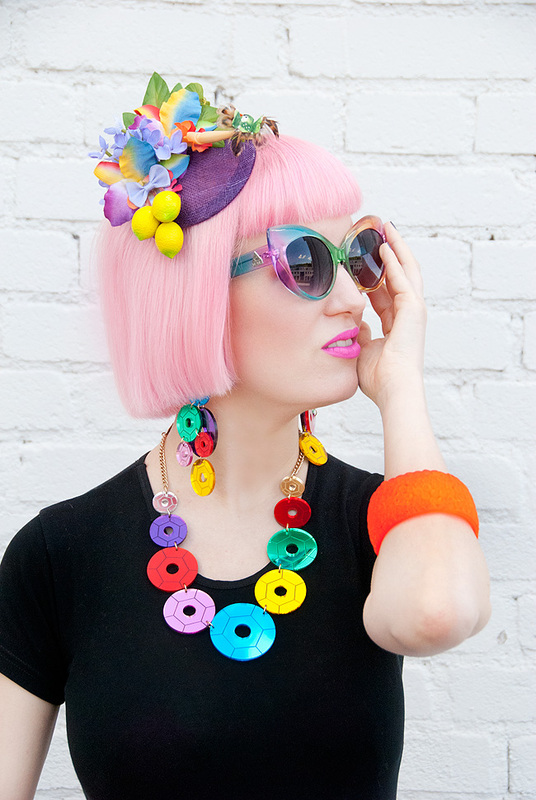 Those amazing blogger girls out there are my daily inspiration. They influence my style more than any magazine will ever achieve. Isn't it unfair to just consume their pictures and give them nothing back? They all put a lot of work, time and effort into their blogs and most of them probably don't earn money from that. Big thanks to all of them! As a little gift in return, I spread this pictures here and hope they get your attention and love just as they have mine. Wishing you a happy day and don't forget to tell me which looks you like best.